Seeking to reengage with the sport she once loved, Susan Lacke spent a year exploring running in its many shapes and forms. From races with giant cheese wheels to a regional wife-carrying competition, a naked 5K to climbing the dark stairwells of the Empire State Building, Lacke's brave forays and misadventures are chronicled in wondrous and funny stories. Seeking to reengage with the sport she once loved, Lacke spent a year exploring running in its many shapes and forms, taking on running challenges that scared her, pushed her, and downright embarrassed her. From races with giant cheese wheels to a regional wife-carrying competition, a naked 5K to climbing the dark stairwells of the Empire State Building, Lacke's brave forays and misadventures are chronicled in wondrous and funny stories. 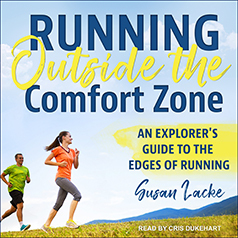 Running Outside the Comfort Zone uncovers the brash, bold, and very human sides of running, and along the way Susan rekindles her own crush on America's favorite all-comers sport.